The essential element of Keynesian economics is the idea the macroeconomy can be in disequilibrium (recession) for a considerable time. Keynesian economics advocates higher government spending (financed by government borrowing) to help recover from a recession. Liquidity trap. When low-interest rates fail to boost demand. Importance of confidence to economic cycle. Deficit spending. In recession, Keynes advocated government borrowing to provide an injection of demand into the economy. Keynes did not advocate allowing higher inflation. During periods of growth, Keynes argued inflation should be kept under control. Welfare State. Keynes did not necessarily advocate higher government spending as a % of GDP. He argued spending should increase only in an economic downturn. Classical theory suggested any fall in investment would lead to lower interest rates; this fall in interest rates would reduce saving, increase investment and cause the economy to return to a new equilibrium of full employment. However, Keynes’ analysis suggests this is unlikely to occur, due to a number of factors, such as a liquidity trap and the general glut of savings. Liquidity Trap. A liquidity trap is when low-interest rates fail to boost demand. For example, if confidence is very low, people won’t borrow – even though it is cheap. Also, very low-interest rates can make banks unprofitable, so they reduce lending. General glut. If saving is high and consumer spending low, firms will have a lot of unsold goods. In this climate, they will cut back on investment. Animal spirits. If there is an initial fall in investment, businessmen may have negative confidence. Their ‘animal spirits fear recession and lower profits, so they cut back on investment. Consumer confidence may be adversely affected, and they spend less too. Thus Keynes emphasised the importance of expectations and confidence. Negative multiplier effect. Keynes popularised the idea of a multiplier effect. The idea that a fall in injections into the economy has a knock on effect and the final impact may be greater than the initial. If a firm reduces investment, people lose their jobs, and this higher unemployment leads to lower spending and affects everyone in the economy. 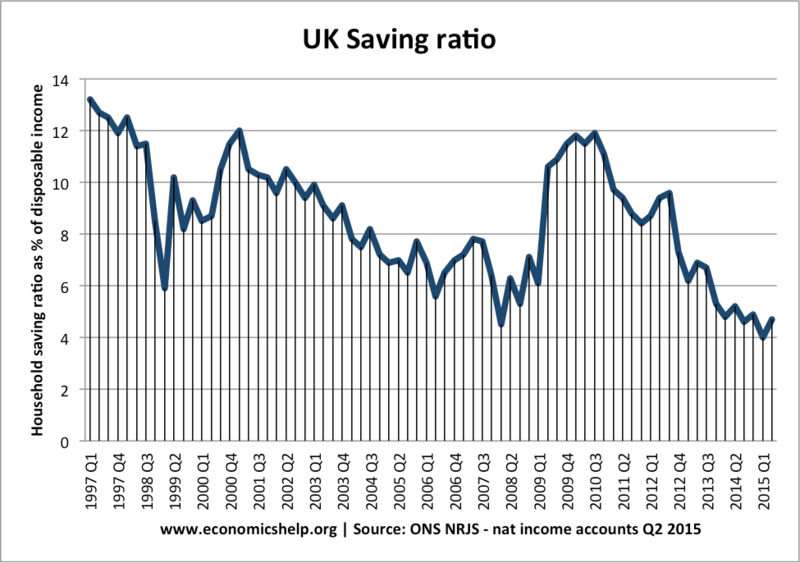 Note: the surge in savings ratio at the start of 2008 recession. A paradox of thrift. In a recession, people take a rational approach to be risk averse – fearing a possible recession, they increase savings and spend less. When this lower spending is aggregated, it leads to lower overall demand in the economy. Lower interest rates may not increase consumption very much because – the income effect of lower interest rates mean people have less income. According to classical economic theory labour markets should clear. In this model any unemployment is due to wages being artificially kept above the equilibrium through minimum wages e.t.c. (real wage unemployment) According to classical theory, the solution to unemployment is to cut wages and allow wages to clear. However, Keynes argued this was unsatisfactory. Firstly, even in the absence of unions and minimum wages, workers would resist nominal wage cuts. Secondly, a cut in wages wouldn’t necessarily solve disequilibrium. Lower wages would further depress income and spending, leading to lower aggregate demand, and therefore lower demand for labour. Keynes’ contribution was to show the interaction between labour markets and the national economy, and not treat the labour market in isolation (e.g. from micro perspective). It is this macro perspective on savings and labour markets that led to the creation of macroeconomics. An important classical assumption of the day was Say’s law. This stated that supply creates demand. However, Keynes believed the opposite was true. Keynes argued – demand determines the level of national output. 1. Governments should provide counter-cyclical demand management. Keynes was critical of the UK 1931 budget, which cut wages for hospital workers, and cut back spending on roads and new houses. He argued this would depress demand further and make the recession worse. Instead, he advocated higher government spending financed by higher borrowing. Keynes’ policy recommendations went against classical orthodoxy. Classical orthodoxy argued higher government spending would crowd out private sector investment. 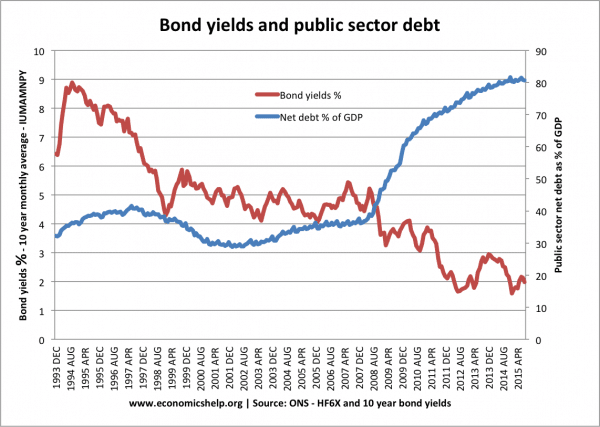 Higher government borrowing would push in interest rates on bonds and reduce the quantity of private sector investment. The Treasury view was to try and balance the budget, but Keynes’ criticism was this policy of spending cuts and tax rises only reduced overall aggregate demand. 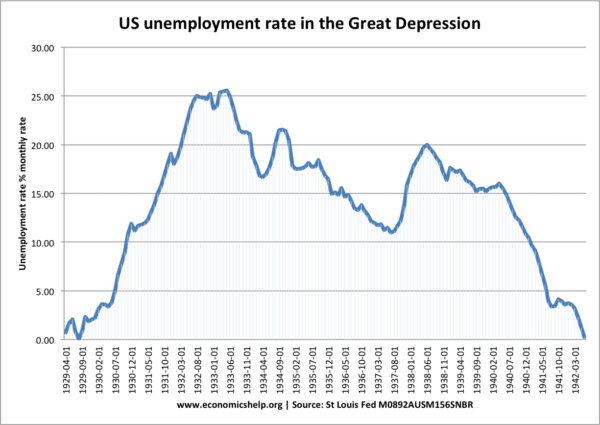 US unemployment in the 1930s shows the prolonged downturn in the economy. Accelerator effect. This states that investment is highly volatile. If the rate of GDP growth falls private sector investment falla. However, if government spending increased the growth rate – this would encourage the private sector to also invest. Thus government investment could complement private sector investment – not crowd it out. Multiplier effect. Government spending could have a bigger final impact on real GDP. the Multiplier is likely to be higher in a recession because there are unused resources. Ending the glut. Keynes’ strongest argument is that in a recession, private sector saving rises sharply leading to unused saving. Therefore, the government spending is merely making use of unemployed resources. Bond yields on government borrowing won’t rise because the private sector want to buy government bonds. The justification for government borrowing and higher spending only occurs at certain times of recession and evidence of a liquidity trap. Keynes would agree during normal growth, higher borrowing does cause crowding out. 3. Phillips Curve. Keynes didn’t specify the Phillips curve, but later it was tacked onto Keynesianism. The Phillips Curve suggests the government faces a trade-off between unemployment and inflation – with Keynesians typically giving greater importance to reducing unemployment. 4. IS/LM Model – another development from Keynesian theory. The modelling of national output to money, government budget and business expectations. Keynes’ great work “The General Theory of Money” written against the backdrop of the Great Depression. It introduced new economic concepts, such as liquidity trap, deficiency of demand, the multiplier effect and principle of effective demand. It is the cornerstone of macroeconomics. This quote illustrates Keynes capacity to create thought-provoking examples. It illustrates how Keynes believed the problem was of insufficient demand and unemployed resources. Here intervention can stimulate economic output, and through a multiplier effect create improved living standards. Keynes argued that Monetary policy was relatively ineffective in in influencing demand. Many economists now see that monetary policy can play a role. There is less debate about fiscal vs monetary policy. Fiscal fine-tuning is very difficult. 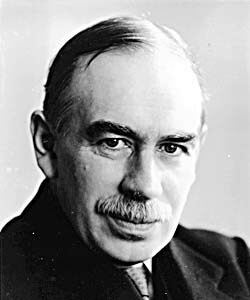 A criticism of Keynesianism is that it is hard to make minor changes to fiscal policy to influence demand sufficiently to ensure stable growth. Political costs. A major criticism of Keynesianism is that it invariably leads to the growth of the state, and higher inefficient, corrupt spending. To ‘pump prime’ the economy, the government end up spending money on projects which creates vested interests and after the recession proves impossible to cut back. Therefore, Keynesianism has a tendency to increase the size of the state, which some see as a major drawback. Break down of Phillips curve in 1970. In the 1970s, Keynesianism fell out of favour as stagflation showed rising unemployment and inflation. Instead, a new strand of economists suggested the importance of supply-side economics. Supporters of Keynes would say the 1970s didn’t negate his work. It was just that the 1970s saw a different set of problems – there wasn’t large demand deficient unemployment, but a different problem – cost-push inflation. Also, in the post-war golden period, we never experienced a great recession so the main plank of Keynesian theory was never really needed. There is no evidence, Keynes was keen on minor fine-tuning. However, the Great Recession of 2008-13, saw a resurgence of interest in Keynesianism because there were many similarities to the great depression of the 1930s. There was a precipitous fall in GDP. Bond yields remained low despite higher government borrowing. In the US and UK, government borrowing rose rapidly, but bond yields fell – suggesting government borrowing wasn’t crowded out. This graph of total US debt shows how government borrowing rose in response to rising saving and falling private debt. Arguably, government borrowing should have risen even more to ensure a stronger recovery. To some extent economies which pursued fiscal expansion, showed economic recovery. The UK was recovering in 2010 – until a reversion to austerity in 2010 caused a double-dip recession. It is certain Keynes would have advocated longer and deeper fiscal expansion for the UK. Multiplier effect. The IMF report showed there was a considerable multiplier effect. Countries which cut spending caused a big fall in real GDP. There are some limitations of Keynesian theory. For example, it would be interesting to know the role Keynes gave to quantitative easing and money supply alongside fiscal policy. I would argue that Keynesian economics is not flawed. ‘Flawed’ suggests there are fundamental problems. In times of prolonged recession, the theory holds up relatively well. There is certainly a danger of it being misapplied (e.g. higher borrowing during economic growth). However, it offers a relatively robust explanation of why deficiency of demand can cause a prolonged recession. For example, it is hard to defend rival theories such as the real business cycle – that the great recession has been caused by technical changes. In normal circumstances, there are practical difficulties with measuring output gap, but in the recession of this magnitude, it becomes obvious what the problem is. This entry was posted in A-Level, economics and tagged keynesianism. Bookmark the permalink. ← What explains the volatility of oil and food prices? References to increased government spending as a stimulus to an economy appear not to be linked to the origin of the money spent. If the money is generated as debt-and-interest-free by the treasury of a national government bank the situation is quite different to borrowing the money as debt-based money from a private bank. The debt-and-interest-free-money will give a good outcome. The debt-based-money will give a short term boost with a delayed bad outcome. Debt-and-interest-free money will kick-start the economy as is did in Australia from 1911 until the early twenties with the Commonwealth Bank. As it also did in numerous local economies with alternative currencies. Debt-based money is more common as the banks hate debt-and-interest-free-money. Central Banks tend to guard their monopoly carefully and quash any effort to use debt-and-interest-free by the treasury of a nationalised government bank. The Central Bank of Kenya is now banning the successful alternative currency, Bangla-Pesa. The recession lasted for a long time means what? hello mr your explanation of Keynesian economics is vey important issues in economics field .please attach your note lecture on my email address.